Tuesday 2 – Saturday 6 June 2015. Stars of the hit BBC TV show Strictly Come Dancing Kristina Rihanoff and Robin Windsor are set to dazzle Newcastle audiences this June in the 1930s song and dance extravaganza Puttin’ On The Ritz, Tue 2 – Sat 6 June 2015. The world champion dance professionals are best known for their mesmerizing Saturday night Ballroom routines with celebrity partners, but are now set to bring a heady dose of stardust and some old-Hollywood glamour up north. Puttin’ On The Ritz conjures up the golden age of Hollywood and features the most famous song and dance moments of the last 50 years. It’s a whirlwind musical journey showcasing the music of George Gershwin, Irving Berlin, Cole Porter and more, and is packed with nostalgic favourites including Cheek to Cheek, Alexander’s Rag Time Band, Night and Day, I Got Rhythm, and of course the headline hit Puttin’ On The Ritz. Kristina and Robin will appear live on stage alongside a troupe of award winning singers and dancers. Kristina, originally from Siberia, is a world finalist professional ballroom dancer, instructor, choreographer and author. She has performed and competed around the world and came first place in the South African National Latin Championship 2006. She has also been a multiple finalist for the U.S. National American Rhythm Finals, Open to the World Mambo Championship, American Rhythm Finals, World Exhibition British Final and British Open (Blackpool). Kristina was a cast member on the hit US show Dancing with the Stars before being snapped up by the BBCs Strictlyteam where she has been a professional dancer for six years. In the latest series she reached the semi-finals with her celebrity partner Simon Webbe from the pop band Blue. Robin, also a dancer from a very young age, has represented England in the World Dance Championships. Like Kristina, he has starred in a multitude of shows on Broadway and in the West End and toured internationally. He was part of the cast of hit show Burn the Floor for over 7 years before joining Strictly. Robin has been Kristina’s professional Ballroom partner for five years. 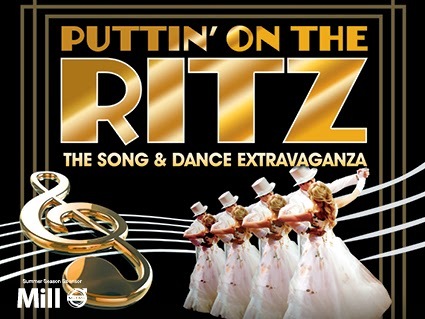 Puttin’ On The Ritz appears at Newcastle Theatre Royal from Tue 2 – Sat 6 June 2015 (Evenings: 7.30pm, Matinees: Wednesday and Thursday 2pm and Saturday 2.30pm).